I was first introduced to the community of Subbed In under a big fig tree with a glass or two of white wine in me; the simple viewer. The second time, I was a flighty acquaintance to Subbed In, now as a: “I’m-trying-to-look-three-dimensional,” reader. This has been the most thrilling juxtaposition I’ve ever experienced in my life thus far. It beats that one time I was with upper-class city friends waiting twenty minutes for a train at my local station. Mind you, my local station has a burnt down tattoo parlour and IGA on one side, and on the Other Side, we have what my friend calls: “the best damn burger” from a blatantly racist tuck-shop and yet another IGA. Heavenly I know. Founded in March 2015, Subbed In showcases literary talents of local and interstate champions (and plain old emerging artists) by the work from the wonderful Dan and Stacey. 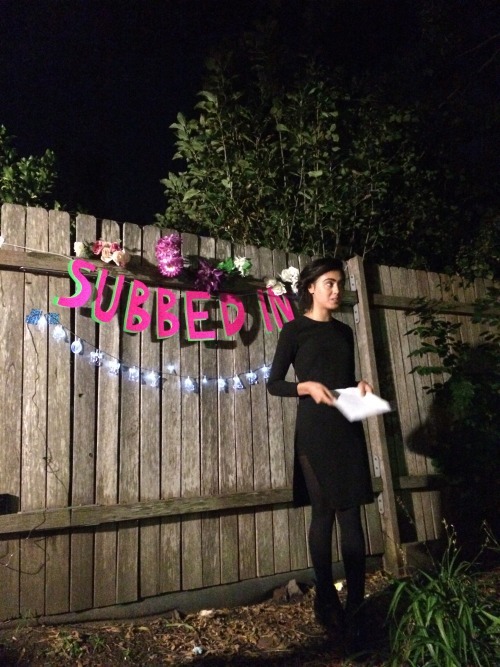 Subbed In, since it’s launch, has showcased more than fifty writers, playing across sharehouse kitchens, backyards, parks and The National Young Writer’s Festival. Subbed In keeps everything peachy sweet and simple – it’s all about the art folks! Subbed In plan to mix it up with more readings, dual readings, publishing fairs and music events over the coming year and beyond. Before Subbed In, I always considered the fact that because I was born and raised (I say with hyper-masculinity) in Western Sydney, I was a bit useless. No one takes you seriously when you say you’re from Mount Druitt. No one takes you seriously when you say you’re from Mount Druitt and you’re a writer. No one takes you seriously when you say you’re from Mount Druitt and you’re a writer and you study at Western Sydney University and you’re not white and you get Centrelink every now and then and…It’s safe to says there’s a lot of factors as to why a lot of people look over Western Sydney in general. And if we are “seen,” we are seen as a location with something to pity and fear. I have a lot of friends who want to be something. Including myself. Creatives in Western Sydney do indeed exist. We are a collective community who has never asked for the pity of the privileged. We only ask to be equal and respected. A lot of people think Western Sydney is small and therefore small-minded. I wouldn’t necessarily say that a region spanning 8,941 square kilometers with 14 regional councils and over a hundred cultures and spoken languages other than English, something small. What I adore most about Subbed In is that the creators have always been about equality. Every Subbed In event always acknowledges that Australian land is Aboriginal land; poets are given the chance to define themselves without social judgment, and audience members sit with attentive respect and utter love for the creativity in language. It occurred to me, in that Newtown backyard, that no one in Subbed In is defined by what others have once told them to be. No one is afraid to be who they are. No one cares that I’m from Western Sydney. Subbed In has been the first ever space within the City that I felt complete disconnect – meaning myself. I am from Western Sydney but I am not Western Sydney itself. Everyone at Subbed In treated me almost like a newborn human. I came straight out from a warm, dark womb as an adult and read some poetry. People wanted to ask me about the themes in my work, take note on how my hands shook as I performed, but how soothing my voice was. I wanted to compliment everybody. I wanted to shout excitedly about the books I have read, my desire to research, and my continuous thoughts about androgyny/memory/physicality. Not once did anyone ask me where I was from. I would like to take this space to thank Subbed In for creating the closest damn thing I will ever feel to creative equality for now. Subbed In allowed for my first big step in writing, and I felt comfortable and memorable throughout the entire process. It’s so difficult to create such an equal space, but the right people, with the right love of art, makes everything look so easy. Winnie Dunn is currently in her third year of studying a Bachelor of Arts Pathway to Secondary Teaching at Western Sydney University. She majors in English and sub-majors in Modern History and Education. Winnie has been published in WSU’s magazine, and she blogs for The Red Room Poetry Company.